Media captionHarmonie-Rose lost her limbs to meningitis but was pushed around a half-marathon course. A girl who lost all her limbs after contracting meningitis was cheered across the finish line at a half-marathon. 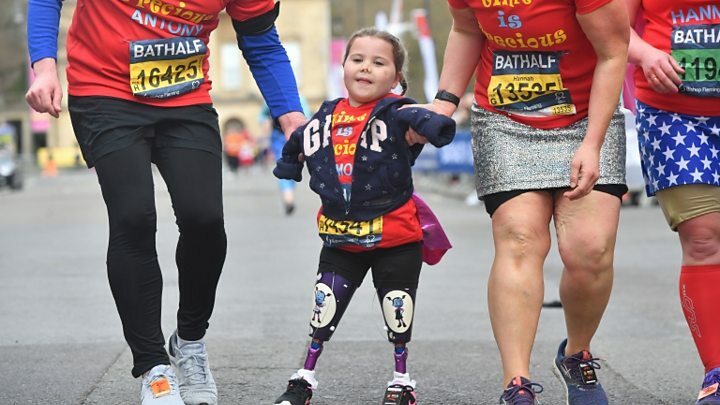 Harmonie-Rose Allen, five, walked the final few metres of the course in Bath on Sunday after being pushed for the rest by a team of family and teachers. As a baby in 2014 Harmonie-Rose contracted meningococcal septicaemia and was given a 10% chance of survival. She said the half-marathon had been "freezing" and she was "a bit tired". A seven-person support team, including two of Harmonie-Rose's teachers and family, took it in turns to push her special running chair around the course. But she decided to walk the final yards. Her proud parents, Ross Allen and Freya Hall, gave her a big hug as she crossed the line. Ms Hall said: "We stopped a few times and Harmonie did get a bit bored but she soldiered on, she was such a little star. "She was amazing. She is just a normal five-year-old and after an hour she was [asking] 'Where's my mummy?' but she just soldiered on. Two other children also took part alongside Harmonie-Rose. Seven-year-old Devon Baker, from Midsomer Norton, is undergoing treatment for leukaemia, while Ellie Payne, also seven, has undergone heart surgery. Image caption Harmonie-Rose's mother Freya Hall said she felt "so proud of her"